"I've been essentially housebound, and if I have a seizure during those few times I go out, it's embarrassing for me and my family," Cheryl says. Cheryl is one of 3 million Americans with epilepsy, and one of the unfortunate 30-40 percent whose seizures are uncontrolled. For those patients, life is extremely limited: they cannot drive or hold a job. Furthermore, they are often stigmatized, which can lead to isolation and depression. There are many different types of seizure, though a grand mal seizure, which involves a loss of consciousness and violent muscle contractions, is the type most people picture when they think about seizures. And Cheryl had grand mal seizures. Lots of them. "I once had 42 grand mal seizures in 3 hours," she says. "I couldn't cope, my family couldn't cope. There was a lot of family tension." Epilepsy is a neurological condition where disturbances in the normal electrical function of the brain cause recurrent seizures. People can have a single seizure from a high fever or an injury, but epilepsy is the diagnosis when seizures recur. Cheryl's seizures began 18 years ago, stopping only during her pregnancies. Doctors unfamiliar with epilepsy gave her varying diagnoses, and even suggested her problems were psychological. 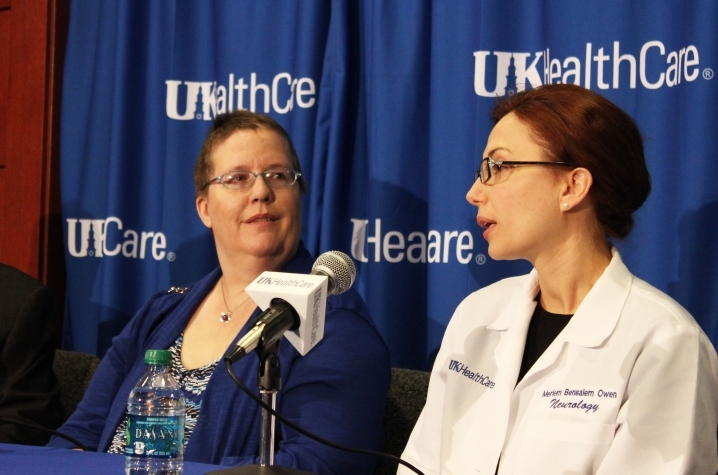 The Lowmansville, Ky. native then made the 2 1/2 hour trek to UK, where Dr. Meriem Bensalem-Owen, director of the Epilepsy Program at UK HealthCare's Kentucky Neuroscience Institute, began the process of pinpointing the location of her seizures and drawing from an arsenal of treatments to help Cheryl. "Medicine is almost always the first line of treatment and the vast majority of epilepsy patients are able to control their seizures with drugs," Dr. Bensalem-Owen said. "Unfortunately, we tried several different drugs, and none of them helped Cheryl." Cheryl said the side effects of some of the drugs were intolerable. "Even if they did help -- and most of the time they didn't -- I was a walking zombie," she said. Dr. Bensalem-Owen then tried a procedure called vagus nerve stimulation, in which a small device delivers regular impulses of electrical energy to the brain via a large nerve in the neck called the vagus nerve. It didn't work either. Even worse, brain mapping showed that the focus of her seizures was in a crucial area of the brain controlling motor function. Surgery to remove the brain tissue, the usual next step in the treatment process, was not an option for Cheryl without the potential for permanent paralysis. "She was disconsolate, and we were worried, as Cheryl was at extremely high risk for sudden death from her seizures," said Dr. Bensalem-Owen. By then, however, Drs. Bensalem-Owen and Craig van Horne, the KNI neurosurgeon working with Cheryl, had heard of a novel therapy called Neuropace that was in clinical trials. "Previous research has demonstrated that electrical stimulation of the brain can stop seizure activity," Dr. van Horne said. Based on this premise, scientists developed an implantable device that continuously monitors electrical activity in the brain, detects abnormal electrical activity and delivers imperceptible levels of electrical stimulation to normalize that activity before the patient can sense an oncoming seizure. The system includes a box about the size of a flash drive that is implanted in the skull, two wires containing electrodes that rest on the area of seizure focus, and two external components: a remote monitor and a programmer. "Metaphorically speaking, it's a defibrillator for the brain, much like a pacemaker for the heart or the paddles they use in the ER to shock a heart attack victim back to life," Dr. Van Horne said. According to Dr. Van Horne, the device also records seizure activity, which Cheryl retrieves every day using a special monitor and sends to a database. "We can access and analyze Cheryl's data between appointments and assess whether adjustments need to be made," Dr. van Horne explains. Dr. van Horne implanted the device in a 5-hour surgery last November. After four weeks of recovery, Dr. Bensalem-Owen took the device "live." Cheryl says she can already tell it's helping. "I feel as if I'm having half as many seizures as before, and my seizures seem much less severe," she says. "I can't wait to get out more and do things with my family." More importantly, Cheryl says, her sons Mitchell, 18, Michael, 15, and Nathaniel, 12, are reaping the benefits. "I have more time to do homework and hang out with my friends now because my mom doesn't need me around to take care of her as much," Nathaniel says. Dr. Bensalem-Owen stresses that Neuropace is not a cure -- Cheryl will continue to have seizures, but "we hope they will be fewer in number and less severe," she says. "To the extent that Neuropace gives Cheryl relief and helps her resume a more normal life, it's a helpful treatment."